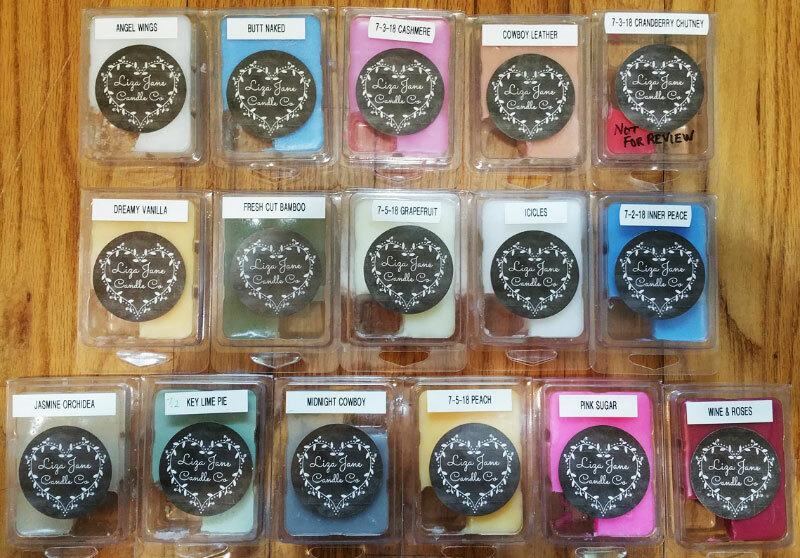 This is a review of wax melts by Liza Jane Candle Company wax melts, a candle and wax melt business in Waxahachie, Texas. Liza Jane Candle wax melts may very well be my favorite vendor/indie wax melt brand! Find out more about Liza Jane Candle Company, and see reviews for more scents. I love this scent! It's primarily a baby powder scent, but there's something else, a very sweet floral note like jasmine, and a little musk. Looking at the scent notes, I don't smell rose, wood or vanilla, and I don't know what hawthorne smells like. I've smelled this scent before, and it smells like super sweet cherries with a watermelon note and a little bit of a tropical fruit note, and maybe rich vanilla (although it's definitely not a bakery scent). Very nice! Looking at the scent notes, I don't smell apples, and not really the strawberries either, although what I think is cherry is probably a combination of all those fruits. Yep, it's leather, and it smells great! Also makes a great mixer... smells fantastic when mixed with pine, woodsy, patchouli or cologne scents. This smells like a combination of maraschino cherry and cranberry, or maybe cranberry with a candy note. It's fresh and sweet with some cranberry tanginess. It's not an authentic cranberry scent, but I still really like it. A sweet rich vanilla buttercream. Scent started dissipating within 2 hours. This is not really a bamboo scent, as bamboo has a nutty coconut note. But it's fantastic! It smells like hothouse flowers, a combination of honeysuckle and jasmine with watery and grassy green notes that keep it from being too sweet or perfumey. Unfortunately, the scent started dissipating within 1.5 hour. Fantastic zesty white grapefruit scent. It's not a sweet pink grapefruit. It might have a smidgen of lemon in it. Nice and thirst-quenching! I've smelled this scent before, and it's fantastic. It's a raw wood scent, like a birch or light wood, with a fresh note, and maybe also mint (fresh mint, not peppermint or spearmint) and maybe a bit of eucalyptus and possibly a smidgen of pine. But it's not a pine scent. It's a nice wintry scent. Looking at the scent notes, no mint! And I don't smell jasmine or sugar, as it's not sweet at all and there are no floral notes. Notes: Energizing notes of cherry & almond blended with notes of neroli, orange flower, jasmine and strawberry. Base notes of cotton candy, vanilla, and raspberry. I can't figure out what I'm smelling, but it's pleasant. It smells like soap with maybe a subtle citrus or orange note, and maybe a bit of floral, and possibly a smidgen of vanilla. It's a little sweet, but not perfumey. Looking at the scent notes, I don't smell most of those notes! On cold sniff it's not a fruity scent, but when melted I definitely smell the fruit, although it's more like fruit scented soap with an orangey note. A nice perfumey scent with jasmine and a hint of something else. Looking at the scent notes, I don't smell rose at all, and not really orange blossom (which is a scent I love). A sweet creamy lime scent. When melted, it has a hint of a lime scented cleaner note, but not in a bad way. It's a fresh, summery scent. A fresh "Cool Water" type men's cologne or body wash. I like it. A nice peach scent, kind of authentic. It's a sour peach rather than a sweet peach, but if you like sweet peach, it smells fantastic mixed with Dreamy Vanilla! I love the Pink Sugar scent, no matter who makes it. It's like a combination of a pre-teen girl's perfume, cotton candy, and a hint of raspberry. I don't smell lemon, but I do smell the musk of the perfume, and maybe a smidgen of the caramel although it's not a foodie scent at all. Fantastic! This smells exactly like the scent name: roses and wine. The rose is the predominant note, but I also detect a sweet grapey wine. It's a nice, interesting combination.